Showing results for tags 'olf'. This is fragment of nice interior décor executed by Pendant la sieste in rough natural fabric. It is suitable both for celebration of Christmas and Valentine’s day. 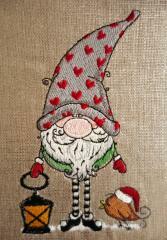 Just look: cap on bird’s head reminds Santa’s cap and cap on head of gnome is embellished by many little hearts! 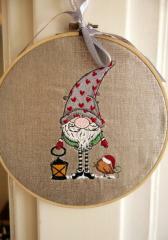 You also may use this pretty thing decorated by Gnome in phrygian cap with hearts holding lantern embroidery design as hand made gift dor these favorite holidays.